Google edition of Galaxy S4 has no differences with the original S4 when we talk about the hardware. Both comes 5″ full HD AMOLED display, Qualcomm Snapdragon 600, 2GB RAM, 13MP/2MP camera, 2600mAH battery. So, the difference is on the software side. Essentially, almost all Samsung specific features explained in the S4 features page are removed. Some of the features you may miss, for example, dual shot, adapt display and animated photo. Luckily, there are some free or paid apps in the market can perform similar functions except the adapt display. As lot of Samsung specific features are camera related, you can expected the camera app in the Google Play edition is quite different. For some users, it is more intuitive and user friendly. It is quite expensive (compared to Nexus 4). It is hard to say whether Google Play edition is better or worse than the original S4. You get pure Android experience on the identical hardware, but you will not able to get any subsidy from your carrier. It means you probably will pay more. 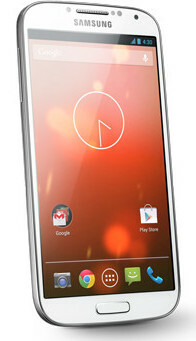 So, If budget is a concern and you want to get pure Android experience, get a Nexus 4. It is at least $300 cheaper (at the price of 4G access, full HD and a microSD slot). I don’t need a knox system which is a total invasion of privacy. It gives access to ever nook an cranny of your information. You can’t turn it off or delete it. The bloat wear put 185 apps on my phone. I use 10 or so apps. Used almost all of the ram. It left about 540 to use. I have a Samsung galaxy s4 (16) I’m retired an don’t need or want all the bloat ware with the 4.3 download which messed up my phone in numerous ways. I’m mad as hell!!! I don’t need a big brother pushing stuff on a phone I bought an paid for. Maybe I can trade for an I phone? ? If you prefer pure Android, you now have more options. In addition to Nexus, Motorola’s Moto X, Mot G , new Droid (Verizon) also have very few bloatware. Does the GPE have ANT+ support? GPE of S4 is listed with ANT+support somewhere. But it probably does not work. My friend failed to make it work last month in the GPE s4.